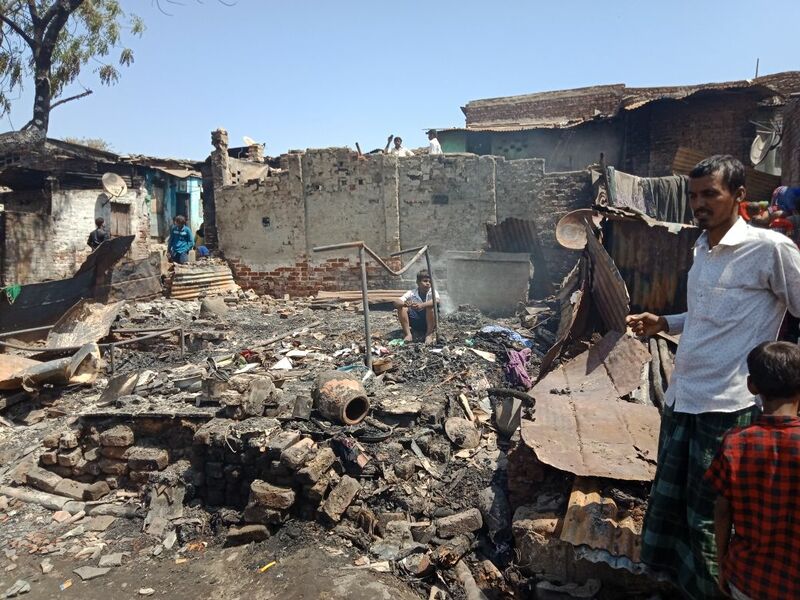 While the Gujarat authorities are still in the dark about what may have caused a major fire, which broke out March 25 night, razing to the ground 243 shanties on the banks of a huge city lake, there appears to be little consolation for nearly 1,000 people, who have been rendered homeless because of the fire. Living in sub-human conditions ever since, the administration, they say, hasn’t yet gone beyond carrying out a “survey” of the losses suffered by them. Mostly Muslim migrants from Uttar Pradesh, Bihar and West Bengal, all of them came to Ahmedabad as labourers to work on construction sites, but never returned. If earlier they were living in the open, the shanties came up about two decades ago, says Raisabanu Ibrahim, one of those whose house has been reduced to a rubble. In a representation to the district collector, Ahmedabad, on the very next day, March 26, Ibrahim says, she has lost “almost everything” in the fire, including furniture, utensils, clothes, cash, and jewelry. “We have even lost our documents necessary to prove that we are residents of the locality”, she adds, requesting the authorities urgent help. 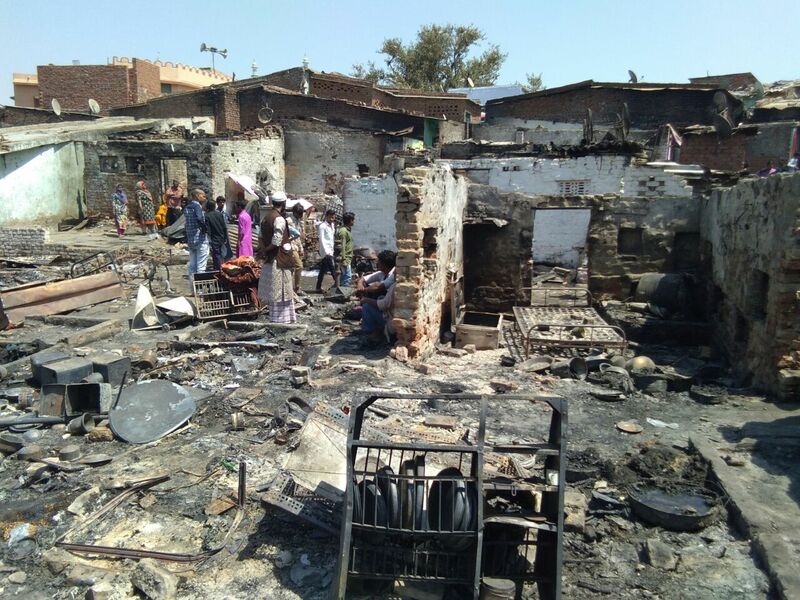 If the details of the survey of the Ahmedabad Municipal Corporation (AMC) authorities are still not available, an on-the-spot survey carried out by Ahmedabad-based NGO Janvikas has said that, in all, the fire has rendered 984 persons homeless, and a preliminary estimate suggests, the loss of their property comes to about Rs 3 crore. While all of them have lost their huts, the survey says that as many as 241 families lost their utensils, 152 families lost their cupboards, 169 families lost their television sets, 225 families lost foodgrains which they had gathered for the year, 222 families lost their furniture, 174 families lost their cash, 53 families their jewelry, and 38 families lost their goats. JItendra Rathod, a senior activist of Janvikas, involved in the survey, told Counterview that drinking water remains a major problem for the families which have been rendered homeless. “While food is being arranged from local sources, it is not known how long it will continue”, he said. 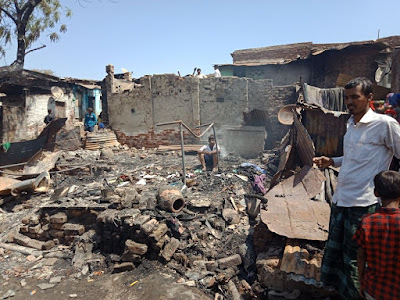 Rathod said, he has “no confirmation” if there is any truth in the suspicion, with the view also floating around that the fire was caused by a gas cylinder or a short circuit, yet, the fact is, these slum dwellers have still not been offered any alternative place of living, or if they be relocated. “It all happened after 11 in the evening, when it was already dark. While locals told us that there is no casualty, a few have suffered burns”, he said. Meanwhile, say residents, the authorities are trying to persuade people in the area to leave the spot to “clear” the rubble. Refusing to leave, a local resident said, there were issues of 'territory', and if if they leave the spot, someone else would claim it. So they would continue to sit on mounds of ash with their belongings. look at the cheap attempt by adding the words "MUSLIM" to headlines. if the slum was HINDU would this reporter have written it?